While catching up on episodes of Scandal, Portia de Rossi appeared on screen and I was mesmerized. She looked flawless! In her role as Elizabeth North, White House Chief of Staff, her brand style is confident, powerful and feminine. All three characteristics came together beautifully in this outfit and inspired today’s topic, the color of confidence! 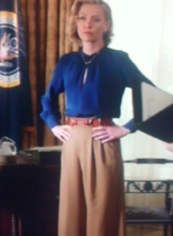 As I watched Portia embody her character, her wardrobe conveyed and reinforced her role. She was compelling and convincing as she stood her ground during a heated conflict with the President. Her confidence was enhanced by her brand style. In addition to impeccable quality and fit, the color camel stood out as the star of her look. When you want to convey confidence and power with the look of luxury, camel delivers! Camel is traditionally a classic color. It spans shades of light camel to deep caramel. When paired with different color combinations, it takes on characteristics that all have the look of success. 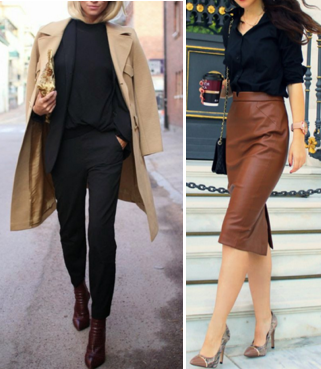 When camel is worn with black, it’s chic, strong and powerful. Even in small accents, camel is striking and stands out. Camel takes luxury to a whole new level of feminine power and sophistication when worn head to toe or mixing tonal shades. Pair with chocolate brown to take the tonal shades even deeper and more sophisticated. Camel is so strong that it even elevates the simplicity of jeans and tennis shoes! When you want to keep your look classic, wear camel with grey or the ultra classic mix of camel and navy. For a more unconventional and creative style expression, pair camel with the color of the season, burgundy! Camel and purple have a regal and creative flair! Camel is a perfect neutral that makes everything look better. Here are other color combos that elevate your style when paired with camel. If your style is Glam, add fur with camel for a chic twist on glamour. There are so many ways you can give camel a fresh new look and make it your own. Combine unique color combinations or fabric textures with camel and elevate your signature style! !